Abstract: This paper explores morphological evidence for the functional category Pred. The Russian lexical items kak and za are introduced as overt predicators with particular “case-absorption” properties. This analysis is extended to other possible predicators in Russian and Polish. The central claim is that overt predicators “neutralize” the inherent (instrumental) case property of Pred in Russian, resulting in “Sameness of Case” effects, familiar from Serbo-Croatian. Abstract: This study proposes an Optimality-theoretic model through which the various grammar components (semantics, syntax, the lexicon, morphology, and prosody) jointly determine the placement of clitics with a phrasal positioning domain, which is either a nominal expression or a clause. In order to render scope, such clitics must be phrase-initial. However, the morphology, carrying out subcategorization encoded in the lexicon, requires many such clitics to be suffixes. A third constraint prohibits affixation across certain syntactic boundaries. These three constraints require conflicting outputs, and cannot all be satisfied simultaneously. Depending on a particular language's constraint hierarchy, at least one constraint must be violated. Thus, a typology of clitic-placement strategies is predicted. This theory of cross-linguistic variation is based on conflicting requirements imposed by the aforementioned components of the grammar. 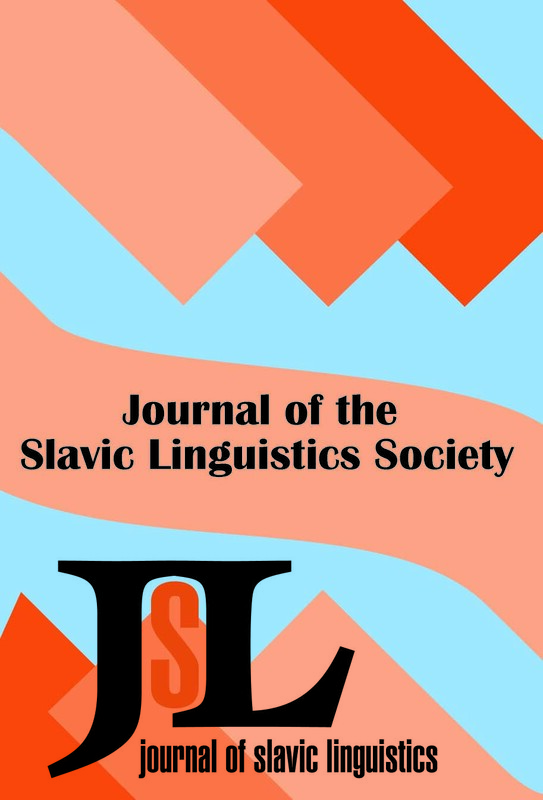 In addition to an overview of clitic phenomena in Slavic and elsewhere, this paper demonstrates the proposed typology primarily using a clitic phenomenon in Russian in comparison to those in Tagalog and Warlpiri. In addition, these proposals make specific predictions about which kinds of clitic positioning can and cannot occur. Namely, these constraints predict an asymmetry in clitic-positioning types, excluding penultimate clisis. The Russian Genetitive of Negation: Theme-Rheme Structure or Perspective Structure? (i) [Ja iskal kefir.] Kefira v magazine ne bylo. [I was looking for kefir.] There wasn't any kefir in the store. It is an important part of the explanatory structure of Babby 1980 that in sentence (i), the Theme is v magazine and the Rheme is kefir- [byl-]. Babby takes Theme-Rheme structure to be crucial for determining the scope of negation, and scope of negation to be a necessary condition in licensing the occurrence of the genitive of negation. But arguments from word order, intonation, and pragmatics have convinced us that kefira in example (i) must be considered (part of) the Theme, and not the Rheme. We now argue that independent of Theme-Rheme structure there is a relevant "perspective structure", a kind of diathesis choice, allowing a proposition involving a suitable verb to be structured with either of its two arguments as "Perspectival Center". In a locative DS, the sentence predicates "being in a certain location" of the "thing" argument, whereas in an ES, the sentence predicates "having a certain thing in it" of the "location" argument. The theoretical status of such a layer of structure remains in need of further investigation. Abstract: This paper subjects the GB parametric account of variation in Slavic numeral systems put forward in Franks (1995) to critical scrutiny from the perspective of minimalism. It is argued that the true nature of the variation lies in the case contexts in which QPs (phrases in which GEN-Q is assigned) can occur in the different languages. It is further argued that this variation is best understood in markedness terms, applied to a specific set of morphosyntactically motivated case features, loosely based on the semantic ones proposed in Jakobson, 1936, 1958). Abstract: This paper presents a new approach to the interpretation and Case-marking of NPs in the genitive of negation construction in Russian. I argue that analyses that determine the scope of an NP based on positions within Case-checking chains fail to account for the lack of a Definiteness Effect on subjects of BE in negated existential and locative constructions. Instead, I adopt a modified version of Beghelli and Stowell 1997, arguing that scope is licensed in the syntax via a feature-matching mechanism. This analysis will successfully prohibit referentially independent NPs from valuing genitive Case in transitive and unaccusative sentences, while simultaneously allowing them to value genitive Case in locative and existential BE-sentences. Abstract: This article elaborates on a problem raised in Babby 1986: the relation of Russian ä‹ij-participles to homophonous ä‹ij-adjectives and to corresponding ä‹e-adverbs (e.g., the participle ugroìajuä‹ij '[who is] threatening' and the adjective ugroìajuä‹ij 'threatening' to the adverb ugroìajuä‹e 'threateningly'). While the formation of active ä‹ij-participles from imperfective verbs is completely productive, the recategorization of these participles to adjectives and adverbs is less so. We show that, within a restricted theory of argument structure and morphology (Williams 1994), the V+ä‹- —> A derivation is quite free, while its particular syntactic successes and failures follow from the predicational properties of the underlying verb's argument structure. We specify which lexical classes allow the V+ä‹- —> A derivation and show how these classes are determined by the aspectual nature of their members (Tenny 1994). Abstract: In this paper we argue that the EPP requirement of Tense (that it occur with a specifier) is an independent syntactic primitive that is operative in the absence of both nominative Case and subject-predicate agreement. This proposal is supported empirically by a class of accusative-Case-assigning unaccusatives in Russian and Ukrainian. For these predicate types, the direct internal argument bears accusative case, but occurs in Spec-TP at PF. This results only when T lacks agreement features, thereby establishing a correlation between a defective Tense, which is f-incomplete, and a f-complete light-v, which values accusative Case of a complement. We conclude that there is no such thing as "Case absorption". This displacement, which is not predicted by Burzio's Generalization, is driven by the EPP, rather than Case or agreement. Abstract: ThIs paper adduces evidence for "first internal argument" as an independent syntactic entity, regardless of case-marking, by virtue of similar behavior with respect to missing-object potential. Implications are explored for the machine translation into English of Russian sentences containing unexpressed objects, particularly for cases in which there is a mismatch for non-expression of the object in the two languages. Abstract: The present paper seeks to update Leonard Babby's 1987 analysis of "heterogeneous" vs. "homogeneous" morphosyntax in numeral expressions, as well as to refine the analysis, making use of recent syntactic developments, namely the emergence of the case-assigning mechanism Agree. The key insight is that numerals differ with respect to whether they contain a valued case feature. Heterogeneous case marking follows from a valued case feature on the nominal, while the homogeneous pattern reflects an unvalued case feature on the numeral, allowing for the numerically-quantified nominal expression to receive a single case from a higher lexical-case-assigning head.